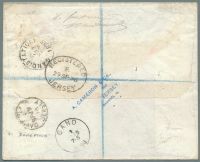 Jersey, 1896 registered use to Ghent, Belgium. 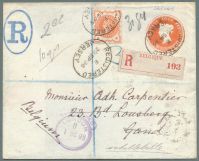 4d vermilion postal entire upgraded with half penny vermilion stamp (Scott #111), tied by oval "Registered E 29 Sp 96 Jersey" markings, with purple "Registered London 1 Oc 96" cds, to Gand (French for Ghent), Belgium, with Belgian registry label.Â Gand and Gand Station backstamps. On reverse: "David Place Sp 29 96 Jersey" originating cds. David Place is the name of a street in St. Helier, probably where the post office was located at that time. The sender, A. Cameron & Co., is still in business in St. Helier as Holl Cameron & Co. Accountants. The Baliwick of Jersey, a British Crown Dependency, is the largest of the Channel Islands, and is located near the coast of Normandy, France.